Louis Navellier is one of the most well-respected growth investors of our day. He's pulled impressive profits from the stock market for over twenty-seven years, he has also helped investors beat the market by nearly a 4-1 margin. Now, with The Little Book That Makes You Rich, he'll show you how to do the same. Growth investing -- which aims to produce capital gains rather than income -- is one of the best ways to invest for success. Best of all, Navellier has created a proven and easy-to-follow approach to growth investing that offers you a rare opportunity to outperform the market without taking on excessive risk. 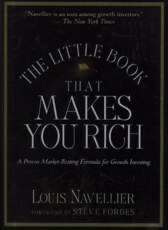 In The Little Book That Makes You Rich, Navellier explains exactly why this proactive approach works and skillfully shows you how it can be used to find stocks that are poised for rapid price increases -- regardless of overall stock market direction. Filled with in-depth insights and practical advice, The Little Book That Makes You Rich details a proven formula for finding growth stocks that beat the market, which combines eight powerful fundamentals -- such as sales growth and cash flow -- with key quantitative ratings that measure the risk versus reward of buying a stock. It also outlines specific tools that take the guesswork out of when to buy and when to sell any stock on Wall Street. You'll learn precisely what to do to best maximize your returns, including how to structure a winning growth portfolio. And perhaps, most importantly, you'll discover how to monitor and maintain the overall strength and quality of your portfolio without spending excessive amounts of time doing so. Louis Navellier has made his living by investing in healthy, vital, growing companies. This approach allowed him to turn his financial dreams into a reality, and it could empower you to do the same. Written in an accessible and engaging style, The Little Book That Makes You Rich outlines an effective approach to building true wealth in today's markets -- and proves you don't need the resources of a powerful Wall Street firm to achieve unparalleled investment success.